The VDCDS PT-563A project updates the capabilities of the VDCDS-designed and developed legacy PT-563 system with greater reliability and image quality by providing a drop-in, replacement Solid State Light (SSL) source Projector for existing PT-563 Cathode Ray Tube (CRT) Projectors. This new Projector system mounts to the bulkhead and PT-563 leg stanchions and connects directly to the existing isolation transformer and video signal cable. The VDCDS PT-563A relies on powerful Light Emitting Diodes (LEDs) for light; it therefore has no need for CRT or Projector lamp replacement, does not need long warm-up periods for start-up, and can be powered down quickly without waiting for the internal fans to cool a lamp. The VCDDC PT-563A Projector upgrade, powered from an external 120V AC power source, also features automatic video formats detection; on-screen menus for easy setup and adjustment, accessible via the supplied Remote Control; precision, a SSL source for years of maintenance free operation; extreme color quality for an unmatched viewing experience, and non-volatile memory that retains the last settings used. The VCDDC PT-563A auto-lock feature provides the ability to automatically detect the format of the incoming signal and adjust the input circuitry to display the received signal. This capability is invaluable in any system where more than one signal will be utilized. The VCDDC PT-563A Remote Control is a user-friendly device that allows the user to change the settings of the Projector from outside of the Projector locker. Substantially all of the commands that can be entered into the Projector are available through the on-screen menus and the remote control. VCDDC PT-563A Menu commands and Projector status are acquired through the RS-232 interface using hyper terminal software and Projector firmware upgrades can also be loaded through the RS-232 interface. The PT-563A Projector automatically stores the alignment and configuration settings of each video signal that it recognizes. Whenever the Projector recognizes the same signal later, it will automatically recall the stored settings. The VCDDS PT-563A comes with a .72:1 extremely short throw lens. f/2.5, 36 lp/mm with MTF >= 55%. The VCDDS PT-563A has internal temperature sensors that constantly monitor the system's internal temperature. If the internal temperature rises to the point that the junctions of the LED light source are in jeopardy of overheating, the system will automatically shut down. The over temperature condition may be a result of ambient room temperature condition, possible failure of the cooling fans or dirty/clogged fan filter media. Because the VCDDS PT-563A light output color is a direct function of the voltage across the LED light source, very precise color control is provided. Color control and stability is extremely good and because the light sources are extremely precise, single color sources (Red, Green and Blue), the colors generated by this Projector are more intense that colors generated by any other technology. Because the system controls color intensity by pulsing the output of LEDs rather than by spinning a color wheel, the light can be pulsed many times per frame for each color. 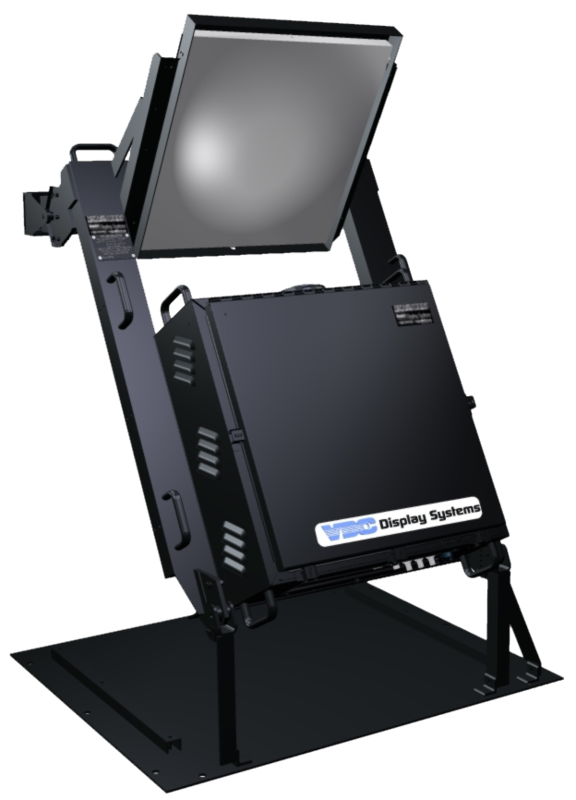 This multi-frame pulsing completely eliminates the rainbow that can be seen in lamp based DLP Projectors.